Do You Choose Life or Beauty? The silkworm makes an interesting allegory about choice. 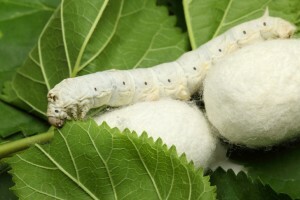 In order to get the beautiful silk from the cocoons, you have to kill the silkworm pupae before it transitions into – what is today – a captive commercially bred and not particularly beautiful moth. Of course, you have to save some of the silkworms so that they can become moths to lay eggs to become silkworms to start the cycle again. Without some balance, we end up with nothing but moths. With no beauty or wealth to feed the moths, we ultimately end up with nothing. Do you choose beauty (and the wealth that can come from selling the silk) – or do you choose life? Do you chose a little of both?